Latching relay with magnetic hold - 4 CO contacts - 6 A. Direct power supply in AC or DC permanently or through an impulse. CSD4 relay is equipped in its standard version of : a locking system with elastic clips on the basis and calsps on the cover, two hexagonal withdrawal clasps permitting up to 36 possibilities, a removable label-holder and a mechanical indicator. Pluggable on the following sockets : SVB, SPVB, SVDL, SPVDL, SRDL 4,8 et SRC. * inductive load L/R 40 ms - 3A x 24 V or 1 A x 48 V or 4 A x 125 V : > 300.000 operations. 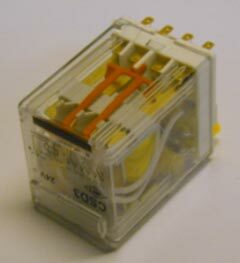 * inductive load I = 4A - cos phi 0,5 - 220 V > 500.000 operations.
. CSD4 relay with specific voltages.